Slightly larger than the lovely CLEO, TESS stands on her own with pockets, pockets, pockets - the same as Cleo but larger - four exterior and two interior. She won't let you down and fall over. She's a caddy and not a shoulder bag. 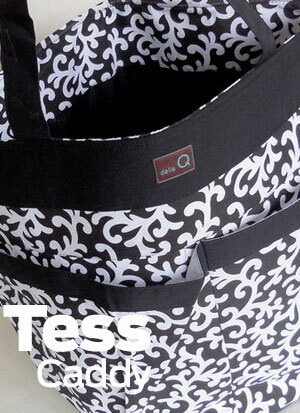 The Tess Caddy is perfect for a large blanket or sweater project. Need something smaller for taking a few work-in-progresses with you? have a look at the CLEO. Psst: Throw this in the washer and let it air dryer -it will STILL looks fantastic! It is a bit softer, but it is still stiff enough to tand up.